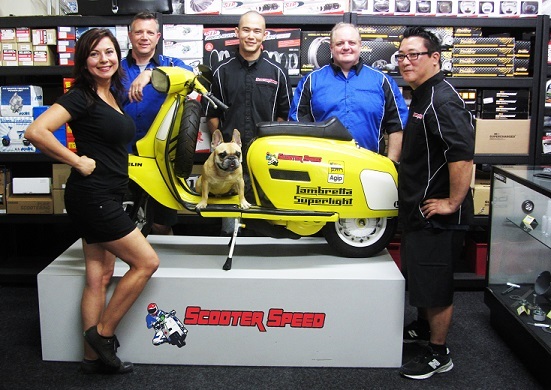 Thank you for visiting Scooter-Speed! We are here for all your Scooter Parts needs. We are authorized distributors of Casa Lambretta, Casa Performance, Rimini Lambretta Centre, Pinasco, PLC Corse, SIP Scooter Shop, Scooter Center, BGM Vespa, Jockey's Boxtenstop, LTH, Heidenau Tires, MB Developments and more. For the past 25 years, Scooter Speed staff have been obsessed with Italian motor scooters. We have built some of the highest recognized show winning scooters since the 80's. Our former race team (Dead Horse) has won numerous titles within the American Scooter Racing Association (ASRA). We are here to serve the United States scooter community with the best parts sourced from around the world. If we don't use it on our own bikes, why should we sell it to our customers? We pride ourselves on top-notch customer service, knowledgeable staff, an easy to navigate website and fair prices. The reason for our success is simple: we treat every customer with the same commitment of respect, service and support. Whether you've just bought your first scooter or you've been riding for years! If there is an exotic part your not seeing on our site, drop us a line and we will be more than willing to source it for you!